REAL ID CARD? - A JEWISH SPY CARD! A SURVELLIANCE SOCIETY RUN BY JEWS is on its way everybody. The Real ID Card is the creation of the Jewish-run US Department of Homeland Security in accordance with the Real ID Act of 2005 which would turn all drivers licenses into a micro-chipped Identity Card. Some states are protesting HERE that the Real ID Card is a “biometric device” designed not to curtail terrorism but to control American citizens’ ability to buy and sell. Does this sound familiar my fellow Americans? I mean, we have all heard of Satan’s #666 have we not? * The Real ID Card records fingerprints. * The Real ID Card records facial scans. * The Real ID Card records eye scans. 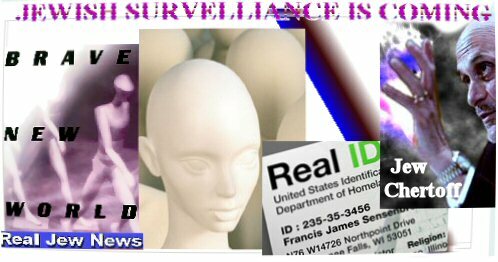 * The Real ID Card records DNA data. * The Real ID Card records religious data and family background. * The Real ID Card records signatures. * The Real ID Card records medical & prescription records. * The Real ID Card records passport, travel, and driving activity. * The Real ID Card records checking, savings, and credit card, calling card, and internet activity. 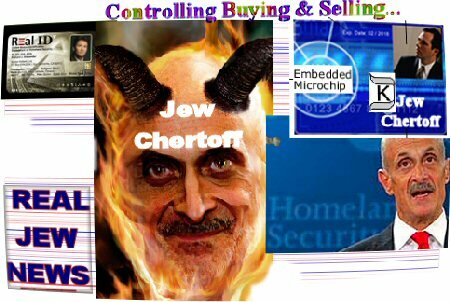 All of the above will be in the hands of the Anti-Christ Jews of US Homeland Security! Whippee everybody! 1. Join a movement to disband the Jew-run US Department of Homeland Security. 2. Vote for Ron Paul as President who was the first to protest against the Jew-initiated Real ID Act of 2005. 3. Commit your life to the Lord Jesus Christ as the beginning of making America a Christian nation again rather than the Jewish nation that America now is. And pray to the Lord Jesus Christ that He would bring the Jews to repentance for their evil schemes against Christian Americans. Indeed - the Anti Christ as predicted in the Bible will be a Jew. And his forerunners at US Homeland Security have his #666 Real ID Card ready for action! i wonder wha sort of draconian punishment they will have for not carrying your card? WW3 WILL PUT A STOP TO THE ANTICHRISTS PLANS AT LEAST TEMPORARILY WHEN THE NEW RULER IN THE NEWLY AQUIRED CONSTANTINOPLE WILL BE A CHRISTIAN LEADER, THIS WILL BE A SPRING BLOSSOMING FOR THE PLANET AFTER THE WINTER OF WW3. MAN WILL HAVE MADE HUGE ADVANCES IN ALL AREAS OF SCIENCE/TECHNOLOGY, ETC AND IT WILL SEEM AS THOUGH 666 IS TO BE IMPOSED ON EVERYONE BUT THEN THE PLANET WILL HAVE ANOTHER CHANCE WITH THIS BLOSSOMING AFTER WW3 AND SOMETIME LATER THE ANTICHRIST WILL APPEAR. I am writing in Ron Paul at election time. Chertoff bears an uncanny likeness to Lenin. Homeland Security czar Michael Chertoff’s last name means devil in Russian..Chertoff literally means of the devil. Chertov ( ff is an American thing) is an adjective and means ‘ belonging to the Devil’. The ” Chertov sin’ means ‘ Son of a Devil’. As such our Reichfuhrer Homeland is a man ‘possessed by a Devil’ ( no doubt about that- MS). The Jehovas Witness are not Christian…they too await a messiah…they have prophesied falsely many times and do not believe that Jesus Christ is the Messiah. Search about who founded the Jehovas Witness…there, you will find many connections. Prophecy can only be of value if it is within the Holy Catholic (universal) Apostolic Church…The gates of hell shall not prevail. “So, be warned, my friend. I have given you the signs of the antichrist. stint. If you have a child after the flesh, teach them to him forthwith. Saints pray on our behalf, as it was also the case in the Old Testament. 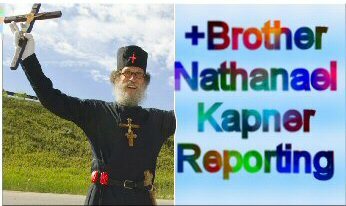 PRAISE GOD FOR YOU BROTHER NATHANAEL. Am Also concerned what would happen if we are led to believe have to get this ID card & refuse to take it. I think they are trying already to put it in our driver’s licenses under the BS to maybe tax us more for the more we drive. Wonder if is better to take the family overseas and do missionary work to stay away from it if is at all possible. Blessings & Grace & Mercy to you. Awaiting His Return with you.